« ‘A Girl in Exile’ by Ismail Kadare – Requiem for Linda B. 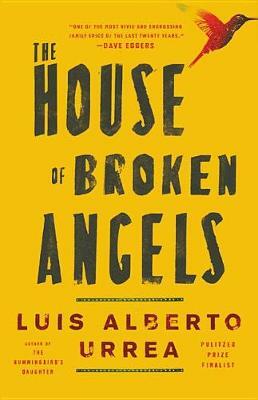 ‘The House of Broken Angels’ is an affectionate humorous portrait of an extended Mexican-American family in San Diego. This family narrative is brimming with life. As the family gathers for the last birthday party of old man Big Angel, his nearly hundred year-old mother dies, so first there is a Latino funeral. We get colorful descriptions via Big Angel of all the shoestring relatives that show up for the funeral. Nearly everyone has a nickname : Big Angel, Little Angel, Mama America, and El Pato. Like any occasion when we have not seen many of our relatives for a long time, we think back on these people and what they were like when they and we were young. Those who became successful are there, and the ne’er-do-wells are there also, trying and usually failing to look solemn and impressive. Of course each one at the funeral has their own view of who the ne’er-do-wells actually are. Some of the younger members of the family are there also. At a funeral, one’s thoughts take a serious turn. We remember those who have already departed. But mostly Big Angel recalls all these family members who he is probably seeing for the last time with gentle loving humor. Even the priest is not exempted from the hilarity. The priest was revved up like some Elysian dragster, about to pull religious wheelies all the way down the track. They were in for it now with no way to get out. After the funeral, the family goes ahead the next day with the birthday celebration for Big Angel who realizes the end is near for him also. Although the family has lived in the United States for a long time and a lot of water has gone over the dam since they left Mexico, they are still proud of their Mexican background. From my experience through the years from childhood on with my own extended family, I can say that Luis Alberto Urrea gets it right in a humorous yet loving way.